The ackee fruit was imported to the Caribbean from Ghana before 1725, as Ackee or Aki is another name for the Akan tribe, Akyem. It is also known as Blighia sapida. The scientific name honours Captain William Bligh who took the fruit from Jamaica to the Royal Botanic Gardens in Kew, England in 1793 and introduced it to science. Because parts of the fruit are toxic, there are shipping restrictions when being imported to countries such as the United States. 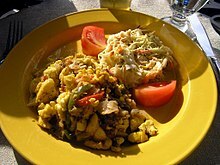 To prepare the dish, salt cod is sautéed with boiled ackee, onions, Scotch Bonnet peppers, tomatoes, and spices, such as black pepper and pimiento. It can be garnished with bacon and tomatoes, and is usually served as breakfast or dinner alongside breadfruit, hard dough bread, dumplings, fried plantain, or boiled green bananas.